Lawn of the Month | Winning is for chumps. There comes a time in one’s life where they must move on to bigger, better things. You can’t stay in you’re old ways, you must move on to new, more exciting things. Like, I don’t know, having your own domain? Yes, that’s right ladies and gentlemen. As of today, this site will no longer be used by the likes of Nate and I, we have spawned our own domain: www.lawnofthemonth.com. Don’t forget to update your RSS Reader. You know there’s some old person group out there wishing they would have jumped on that domain before we did. Oh well, slow people end last. Update: Looks like I had to edit my picture because it was temporarily gone. I’m an avid Digg user and I go there daily for my news. Today, May 1st, has been the weirdest day on Digg. Everyone is posting this secret HD-DVD code that allows you to strip off the DRM and watch them on your Linux box. It’s comes up for submissions and also randomly throughout every story as a comment. When a submission containing the”secret code” gets to the front page, it is immediately taken down. Yes I know what the code is but I’m way to lazy to rip a HD-DVD just to watch it on a Linux box that I don’t have. I have nothing against pirates but I rather buy my movies from Best Buy because I like to have a physical media in my hands to collect. Music? Well that’s an entirely different story for a different time. I’m sure that if you really wanted the code, you would be able to find it. When will the industry learn that you can’t stop a committed community when it comes to DRM. Only time will tell. So while visiting one of my favorite sites, Kotaku, I stumbled across this contest to come up with the best acronym for the letters within F.E.A.R. The winner of this contest would win a copy of the game for the PS3. Well guess who won? That’s right boys and girls, I won. “So what was the winning entry?”, you maybe be asking yourself. Free Eggrolls After Rebate is what won it for me. Very random, semi funny, and off the wall is the way I approached this. You can check out the start and finish of the contest here, here, and here. And apparently they are going to let me gloat with a post on their site. How awesome is that? So unless you have been living under a rock for a year, everyone should be aware that there is going to be a massive Halo 3 beta for the multiplayer side of the game. That date has finally been confirmed for May 16th. Bungie has also released a video that shows a lot of stuff that has been added to the game, stuff previously not seen by the public eye. I won’t spoil it for you; you’ll just have to watch the video for yourself. Personally, I can’t wait for May 16th to come. The beta is scheduled to last until June 6th. Here’s an awesome video I found on YouTube. I love Halo, I love 300, therefore I love this video. Watch and enjoy. I can’t believe the insanity that a maintenance gone too long has caused. People are literally going nuts without there Xbox Live fix. If you didn’t know Live is, or was by the time you read this, down for schedule maintenance. 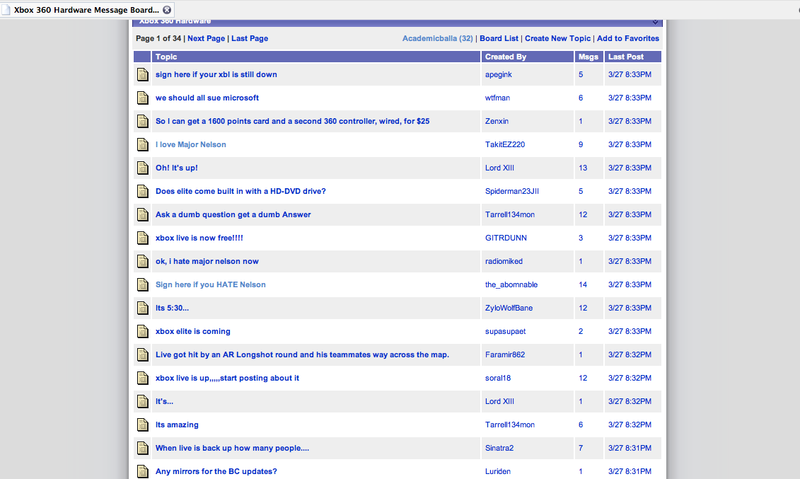 While visiting a forum I go to regularly, I noticed that most of the stories on the front page of the 360 forum are Xbox Live related. Everything from I love or hate Major Nelson (who has nothing to do with the keeping Live running) to we should sue Microsoft. If you really need that 30 cent back that was lost from the 60 bucks you spend a year on your subscription to Live then I’ll setup a PayPal account for you. People are even speculating different reasons for this “maintenance”, saying that it is a cover to get the Halo 3 beta up and running…which would be awesome. But seriously who cares. I think around 10 tonight Major Nelson is going to let loose the secret that he works for Sony and he is the one who shut down Live. I mean seriously people, get a grip of your emotions. It’ll be up when it’s up. Then we can all go back to listen to that whinny 10 year old about how we are hogging the shotgun in Halo 2. Or even better, yelling at his mom to get him some chocolate milk. Realistically, the Terminator would destroy Robocop without even thinking about it. That doesn’t change how awesome this video is though. Watch and enjoy! Lawn of the Month is a collection of random ideas and information, mostly in the area of technology and video games, that we find funny or interesting. We hope you enjoy.